July 20th will always have a special meaning for me. I grew up fascinated by the space program. I made cut and paste books about the different flights to save and reread. I read the “right” science fiction writers – Asimov and Clarke particularly – the ones who wrote scientific science fiction, not the fantasy stuff. I dreamed about humans visiting and colonizing the planets and the stars. So when the day finally arrived that man would set foot on the Moon, I was ecstatic. 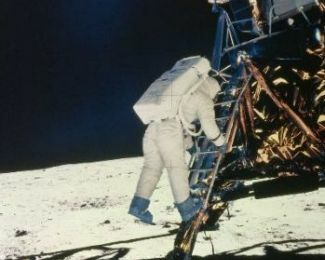 I followed closely the progress of the flight of Apollo 11 to the Moon and was glued to the TV along with millions – one estimate is 450 million – of others around the world as Apollo 11 successfully landed and then Neil Armstrong made the first walk on the Moon. 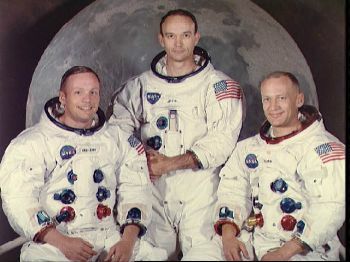 The Apollo 11 crew: Neil Armstrong, Michael Collins and Edwin E. Aldrin Jr.
On that night in 1969 the world held its breath as the Eagle landed and then later listened to the words spoken when Neil stepped onto the Moon. On that night we were one world focused on those three men and their adventure. For many in my generation November 22, 1963 – the day John Kennedy was killed and July 20, 1969 were the bookends that defined the 60s for us. They will always be special days for me.